LOS ANGELES—Saturday will see the Robert D. Skeels for Los Angeles Unified School District (LAUSD) School Board campaign hold its fourth precinct walk in which volunteers canvass for voters. 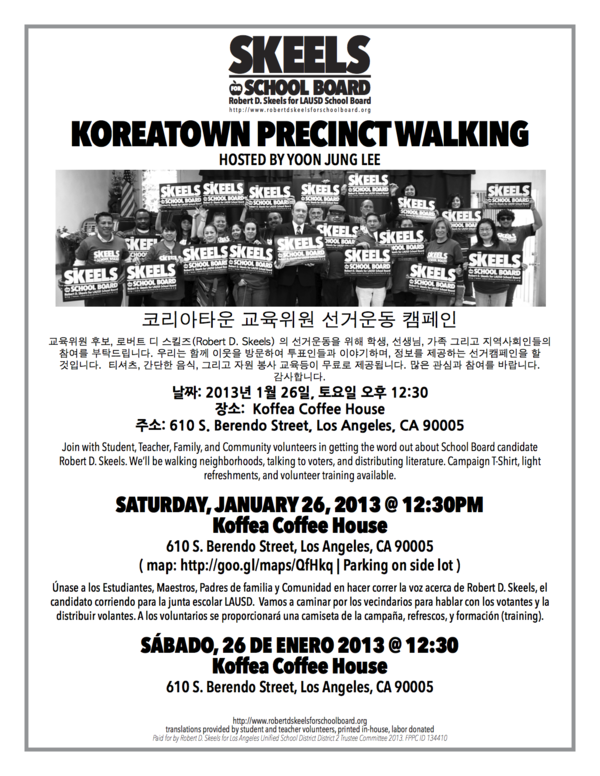 This weekend's activities will occur in Koreatown, with an opening press conference during which adult education student Yoon Jung Lee and candidate Robert D. Skeels will make opening remarks and answer media questions. The former speaker will speak in Korean. "Korean Americans comprise a large portion of our district, but are typically left out of policy discussions. Nowhere was this more apparent than when all of the Adult Education schools in Koreatown were shut down by the incumbent last year, depriving an immigrant community of much needed English, citizenship, and other important classes." The Skeels campaign has vowed to try and reopen at least one adult schools in Koreatown, and advocates for bothDual Language Immersion programs and Korean American studies in K-12 schools. Robert D. Skeels' LAUSD campaign has broad community support and he is the only candidate endorsed by both the Teachers Union and the LAUSD Administrators Union. The campaign has also been endorsed by several national education experts, including former US Assistant Secretary of Education, Dr. Diane Ravitch. Public education activist, researcher, and writer Robert D. Skeels has lived, worked, and organized in District 2 for over 18 years. He and his wife, Yoon Jung Lee, make their home in Historic Filipinotown. Robert has worked in Koreatown for 15 years. 엘에이 코리아타운 교육위원, Robert D. Skeels (로버트 디 스킬즈) 후보가 코리아타운에서 선거운동하기전에 기자회견을 합니다. 엘에이 - 오는 토요일에 엘에이 코리아타운 교육위원후보인 Robert D. Skeels (로버트 디 스킬즈)의 4번째 선거캠페인운동이 있습니다. 이번주에는 자원봉사자들이 코리아타운에 있는 투표인들을 찾아뵙습니다. 교육위원후보자인 Robert D. Skeels (로버트 디 스킬즈)와 어덜트스쿨(성인학교) 학생인 이윤정이 코리아타운을 위한 선거공약을 말하고, 기자님들의 질문에 답할 예정입니다. 기자회견에서 한국어로 선거공약을 먼저 발표할 것입니다. Robert D. Skeels (로버트 디 스킬즈)는 코리아타운에 어덜트스쿨(성인학교)을 적어도 한곳은 열도록 할 것이고, K-12학교에서 이중언어프로그램 활성화 및 한국문화를 배울 수 있는 프로그램을 만들 것을 약속합니다. Robert D. Skeels (로버트 디 스킬즈)는 선생님 연합회(UTLA)와 교장선생님및관리자연합회(AALA)의 지지를 받은 유일한 후보입니다. 또한 남부캘리포니아이민자연합회(SCIC), 유명한 전교육장관이자 교육전문가 다이앤 라비치 (Dr. Diane Ravitch) 교수 등 많은 교육자와 선생님들, 교육단체들이 지지하고 있습니다. Robert D. Skeels (로버트 디 스킬즈)는 엘에이통합교육2지구 (코리아타운, 히스토릭 필리피노타운, 에코파크, 링컨하이츠 포함)에 18년동안 살면서 보다나은 공교육향상을 위한 운동에 참여해 왔고, 교육전문가로써, 작가로 활동하고 있습니다. 그는 한국인 부인, 이윤정과 결혼하여 히스코릭 필리피노 타운에 살고 있습니다. 또한, 그는 15년동안 코리아타운에 있는 사무실에서 일을 하고 있습니다.